Spend a day with BYU Intern, Grace Han, as she learns how to use the Happy Student gift card. She shares what she does (and doesn’t) love about Happy Student Gift Cards. 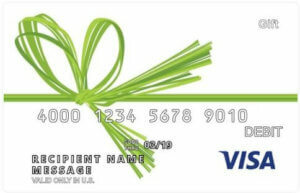 Want to have your own Happy Gift Card Experience? 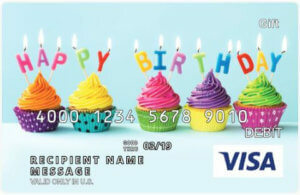 Buy a Happy Card Gift Card. I’m thrilled to introduce the first of many guest bloggers who will be joining me here on the Gift Card Girlfriend blog. Grace Han is a Pre-Business Major at Brigham Young University (BYU) and I met her through the BYU Marriott School of Business Experiential Learning Project–an on-campus internship program at my alma mater. As part of this initiative (and for my own learning), I asked Grace to select a Happy Card from the list of many curated cards that make it easy to buy a fee-free gift card that still allows the recipient to have a choice of redemption options. She chose the Happy Student gift card, and this is her report. Real talk: I used to have a love-hate relationship with gift cards. There is almost nothing better in the world than opening a cute little gift bag to find out that someone got you a gift card to your all-time favorite store or grub spot. It hits the spot every. time. Plus, gift cards can just be so practical and convenient, and frankly, I can justify my purchases to myself more when I’m swiping a gift card versus handing over a debit card. On the other hand, though, I’m always at a loss when I get a gift card to somewhere that’s just not currently relevant to me. And then it can be so troublesome to keep track of all of these cards in my bulging wallet or scattered across my room. I’ll also be the first to admit that on more than one occasion, I’ve fished a gift card that I should have used five years ago out of some random box in the corner of my closet. …That’s why when I heard about the concept of Happy Cards, I was pretty excited! It is essentially all of the pros of gift cards but without most of the pesky cons. For the most part, a dream come true! So what are Happy Cards exactly? Summed up, it is one gift card with many options. 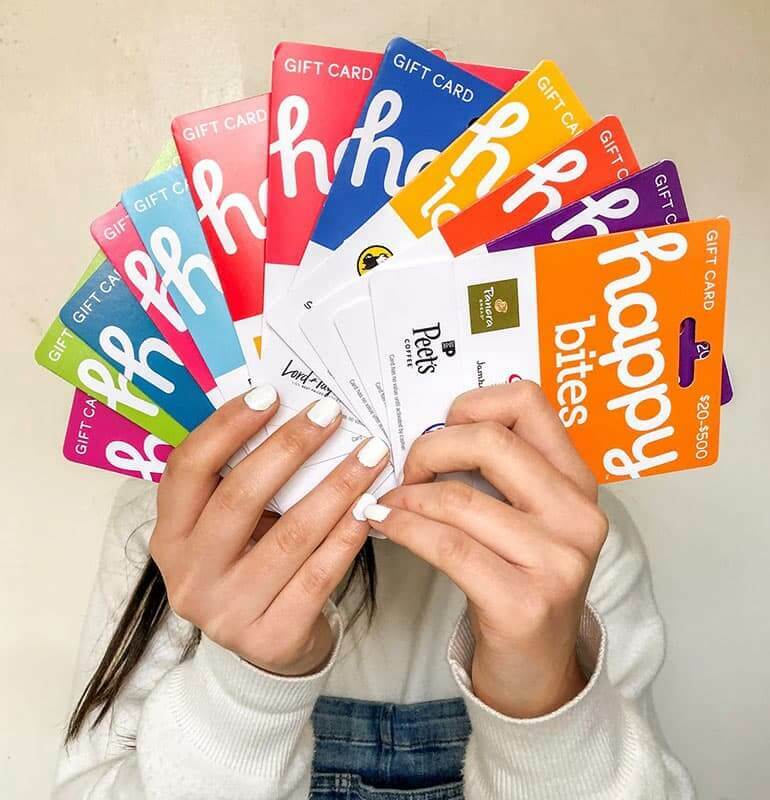 There are several unique gift card possibilities, with themes such as “Happy Bites,” “Happy Teen,” “Happy Student” and more. Each gift card offers redeemability to anywhere from four to seven different brands, from The Home Depot to Sephora to The Cheesecake Factory. So the real question is: What’s to like about Happy Cards? One major point is that Happy Cards offer versatility without the fees associated with general use prepaid gift cards (such as Visa® gift cards or Mastercard® gift cards). So, for example, as a college student, I was most interested in the Happy Student gift card. With one gift card, I got a new ice cream scoop (you know how those late nights can be) at Bed Bath & Beyond, which, on a side note, is a real friend if you are looking to pick up some fresh room decor to spice up your apartment. (Just sayin’.) And then I headed to American Eagle and treated myself to that new pair of jeans that I’ve been eyeing online. And then, to reward myself for a successful shopping spree, I made a quick fry run to Burger King. So on one card, I got an ice cream scoop, a cute pair of jeans, and Burger King fries. And that’s only taking into account half of the places that the card opens me to. I get all of this without having to dish out the bucks for activation fees, maintenance fees, or non-use fees. Speaking of versatility, with one card, I’ve got four to seven more options without having to add four to seven more chunks of plastic to my wallet. That means no more stretch marks on my wallet! ‘Nuff said. Also, the themed approach to gift cards is a life-saver for those (me) who spend thirty minutes standing in front of the local grocery store’s gift card kiosk trying to decide exactly which gift card to get for Jim’s birthday or Pam’s wedding. With Happy Cards, the best choices are already laid out per each card, and all I must do is choose the theme that matches most. So in five minutes, I can pick a gift card, get the card through checkout, and be on the way home. 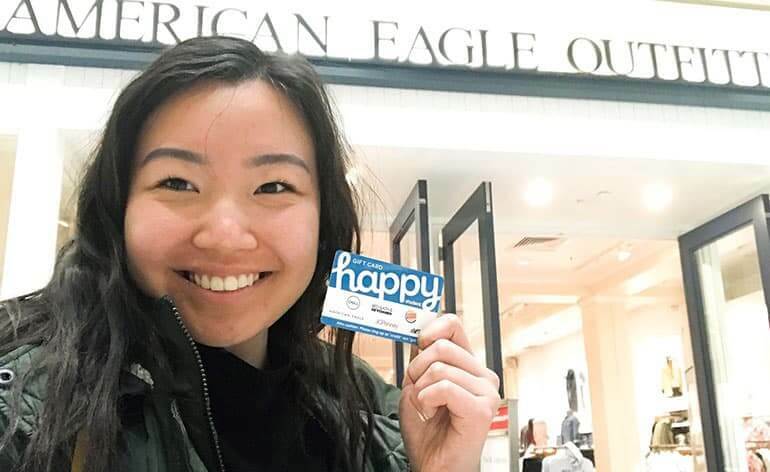 I wasn’t sure if I could use my Student Happy Card to buy the jeans, I mentioned earlier, at the American Eagle website, so I looked into whether or not Happy Cards can be used online. For most of the merchants on the cards, purchases can be made only in store at this time. 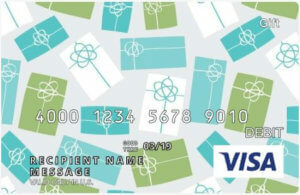 As someone who online shops quite a bit, I would really love the flexibility of getting to use Happy Cards online. For the most part, Happy Cards are super easy to use. You just take the gift card with you when you’re out shopping, eating, or playing, and make sure the person processing the payment runs the transaction as a CREDIT transaction and not a GIFT transaction. This is easy enough, and the instructions are written on the front of the card, but still, it’s an extra step. Also, if the amount of your purchase is greater than the amount left on the card, you have to find out the exact amount left on the card and then split the transaction between the card amount and your other form of payment. Again, not too hard, just potentially makes things a little more complicated. Final verdict: All things considered, I still believe that Happy Cards open the door to the best that gift cards have to offer by providing versatility and convenience at a low price. There are a few catches to be aware of, mainly that they can be used only in store and that they operate slightly differently than some more traditional gift cards. But my own experience using my Student Happy Card has been positive overall, and I’m definitely a fan of the great deal that it is! Thanks for sharing your experience Grace! I too love the flexibility of having multiple brands on a gift card without paying extra. I’m glad you got some good use out of the Happy Student card. I used the Happy Teen gift card on the American Eagle website and I redeemed one online at Regal Cinema too. So while we can’t say for sure it works everywhere online yet, I am hopeful that will become a standard in the near future. If you have questions about Happy Cards or gift cards in general, let me know in the comments below or reach out to me on Twitter (@GCGirlfriend) or Instagram (@Gift.Card.Girlfriend). How and Where Can Happy Cards be Used? 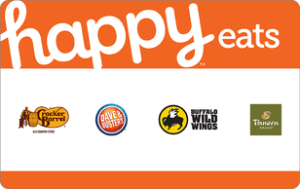 Can Happy Cards Be Used at Multiple Stores? Can Happy Cards be Used Online?